Google released a new beta of their Google Maps for Mobiles application that uses cell phone towers to triangulate the user’s position without needing GPS. The beta is limited to a few cell phone systems right now. I tried it on my Windows Mobile 5 phone and it works great. Naturally, iPhone owners instantly speculated about when Apple and Google would offer this functionality as an update to the iPhone’s Google Maps application. 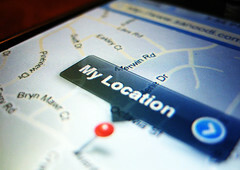 It seems that www.sanoodi.com has beat Google and Apple to the punch, releasing a “My Location” app for the iPhone that seems to enable Cell Tower based positioning in Google Maps. I’ve only used both the official Google solution and this new solution from one location. They both seem to be just about equally accurate. I’m impressed that the “hacked” solution can be just as accurate as the official solution so soon. Update: You can read more information at the Hackint0sh forums. This app isn’t using triangulation yet, which explains why it’s a good distance off most of the time. It passes the CellID of the tower you’re connect to and compared that to a database of towers. Then the position of that tower is fed into Google Maps.